It’s interesting to see how long the consolidation of the main currency pair is. To be precise, from January 18.2015 after the pair reached the exact level where it is today, near the 1.1200. There was some downs and ups as you can see, but we can conclude easy that there is no long-term trend for the past 16 months in which the pair is consolidating after falling from a level of 1.400. It’s not easy to predict where the pair could go in the future period, long term? There is too much developments and new fundamental reasons and the main one could be the Brexit. This decision can strongly affect the fundamental value of the euro and it is difficult to predict where the same could end in the market verus his main opponent, the US dollar. All you can do until is to trade short term intraday, what else. 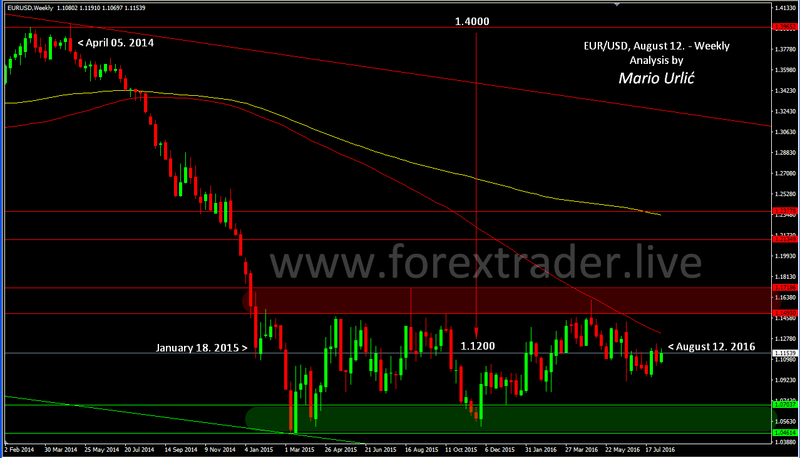 I trade rearly EUR/USD in 2016 and as you can see, I don’t analyse the same as well. It’s to boring! How about you? Veliki pozdrav maistore,evo slazem se sa tvojim konstatacijama jednostavno par je sumoran ,nepredvidljiv cak se ponekad krece suprotno od svoje vrijednosti unatoc objavi dobrih podataka. Kao da FED namjerno okljeva,ceka kao i prosle god. tj sve centralne banke cekaju djelovanje drugih banaka ako izostavimo BOE ali iz drugog puta. Svejedno sam u pripremi za signal kada ga FED odluci plasirati,no mislim da ce pricekati izbore a zaostravanje moze poceti i prije ali podizanje kam.stopa pocetak 2017.Vidit ce mo,eto nadam se da je odmor bio kvalitetan da su baterije pune i da si spreman za nove akcije….L.P.